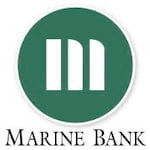 Marine Bank was established in 1993 with a single branch, 12 employees, and an approach for providing “banking the way it should be.” They offer a comprehensive range of products and services, including checking and savings, loans, business services, mortgages, investments, insurance, as well as online and mobile banking technologies. Their professional team places the highest priority on serving and protecting their customers. I don't write reviews very often, but if I could give a negative star rating to Marine Bank for customer service, I would. I have had an account with Marine Bank since I moved here in 2015. As long as you don't have any issues come up, they are fine to work with. However, if anything comes up that is out of the ordinary, like fraudulent charges on your account, don't expect them to be capable of understanding the situation or to handle it in a timely or careful manner. I have had a savings account with this bank for nearly five years. While the interest rate is somewhat low (.5%), there are features integrated with this account that I love. They have a "Keep the Change" program whereby all purchases are rounded up to the nearest dollar, and the change is put into your savings. For the first six months, the bank matches up to $500.